Targeting subatomic particle containment, engineers have turned to a modular concrete design for an accelerator research facility at Uppsala University, Sweden: precast blocks bearing MagnaDense, a high magnetite content aggregate derived from a deposit near the Arctic Circle. BeCo Concrete Products has wrapped up production and delivery of a nearly 300-piece Class III reinforced concrete pipe package: 1,080 feet of 144-in. diameter combined sewer sections, including 16 bends, and 1,192 feet of 66-in. diameter storm sewer sections, with 12 bends and six tees. The installation will anchor drainage infrastructure at IKEA St. Louis, a 380,000-sq.-ft., three-level store with 1,300 parking spaces. National Ready Mixed Concrete Association’s premier Producer Confidence Index, based on results of a 75-member survey, indicates favorable sentiments on current economic conditions and positive view of future business prospects. The survey uses 2006, the best year for ready mixed concrete production and financial performance on record, as a baseline for a 100-point positive Index. Reflecting input from more than 60 producers operating 200-plus plants, the National Precast Concrete Association’s recent Precast Industry Benchmarking Survey indicates 2013 shipments increased 5.2 percent over the prior year, to $16.2 billion—encompassing an estimated 33 million yd. of concrete output and 11 million tons of cement consumption. 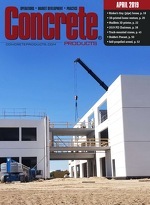 The latest Engineering and Construction Cost Index (ECCI) from El Segundo, Calif.-based IHS Inc. finds cement and concrete markets well supplied nationally, but with pockets of tightness developing—none more so than along the Gulf Coast, where delivery issues and labor constraints are driving price increases.